There's all sorts of press spin seemingly coming out of G4S about the "losses" they will make after their failure to deliver on part of their Olympic contract. I estimate there could be a "hidden" mark-up of between £82 million and £27 million in the G4S contract, on top of the £57m (20%) management fee publicly disclosed. Now I stress that this is only an estimate, but I think this kind of discussion is very much in the public interest, since vast amounts of public money are being spent on the Olympics. I have tried to be fair to G4S in all of my assumptions, laid out below. There are still quite a few unknowns. For instance, we don't know if the £284m quoted includes VAT or not. Any business person would assume not, but I know there was a big brouhaha about VAT and the Olympics a few years ago so I've plotted 2 scenarios for VAT exclusive and inclusive. Also, we don't know what the 20% "management fee" we already know about includes. Does this fully cover the cost of recruiting and managing staff, as one would assume, or is this pure profit, for G4 shareholders? It seems excessive to be pure profit on what should have been a low-risk contract, yet it doesn't seem to be enough to cover all recruitment and management overheads. I've therefore made an allowance for recruitment and plotted a sub-scenario adding typical management overheads back on. Each scenario starts with the cost of the contract minus the widely-reported management fee divided through by 10,000 - the number of guards G4S were contracted to supply under this contract (according to the BBC). 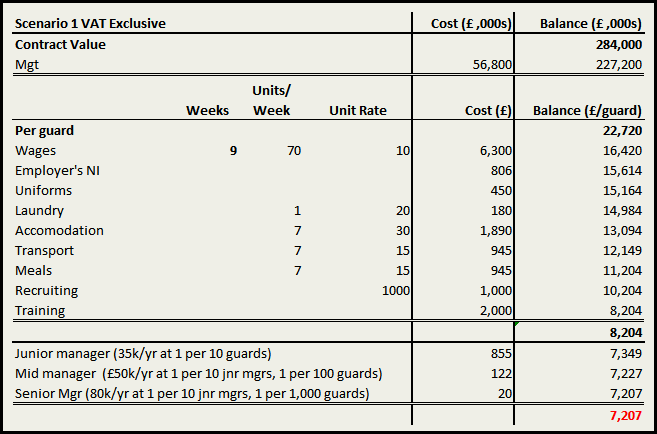 That leaves an allowance of between £22,720 - £18,176 per guard (depending on whether the contract price was VAT inclusive or not) to work in what one can only assume is at most a 9-week window. Cribbing various sources (radio, TV interviews and newspapers) I gather the guards are needed for roughly a 2-month window - from mid July through the Games (including Paralymics) to close on the 9th September. I've allowed for 9 weeks at long 70-hour weeks. According to Payscale.com G4S guards earn between £6.77 and £7.40 per hour. This chimes with figures bandied around in recent interviews although I can't vouch for this personally. I've been kind to G4S here and assumed Olympic guards get paid the £10 per hour they promised to Locog, although the BBC has claimed some are being paid less. It has been claimed by some in recent interviews that G4S were not providing accommodation for the guards. I can't confirm this either way, but again let's try and be fair to G4S and assume they are putting guards up 2 guards per room in a Travelodge or similar (co-bunking is normal, I'm told) at £30 per person, per night. Not every guard will need accommodation, but this is a rough estimate so I'll leave it in. And I've been similarly kind by making an allowance for transport - any cheap accommodation will probably be miles from the events so I'll leave a £15 per person, per day allowance. It should be ample for bulk transport, moving guards around by the bus load. I've also allowed for uniforms x2 at £180 each plus 9 shirts at £10 each, some food and a weekly laundry run. I've also allowed £1,000 per guard for recruitment and £2,000 for training. Again, this should be ample with such large economies of scale. And I've allowed for Employer's National Insurance at 12.8%, but I haven't allowed for any payroll processing overhead as I simply cannot accept that this overhead is not included in the £57m "management fee". 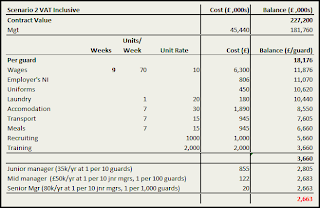 If we assume the "management fee" covers only a very bare organisational overhead, and is mostly intended as pure profit for G4S, then we also need to make an allowance for management. Yes, this is a total farce, but let's call this a management overhead. So we have a management fee and a management overhead, nice work if you can get it! I've then added Employer's National Insurance and then allowed for a 30% overhead on the overhead (yes, I know!) to cover office and pension costs, etc. I've assumed managers will work full time for 2 months of the year managing the guards, and that there will be 1 full time junior manager required per 10 guards. I've then allowed for 1 middle manager per 10 juniors (or 1 middle manager per 100 guards) and 1 senior manager per 10 middle managers. I suppose I should have also included a couple of directors in there too, but divided through by 10,000 guards this overhead is negligible. Any comments/corrections/questions/quibbles - use the form below, thanks!